Have you recently come to the realization that you’ve had an emotionally abusive childhood? If so, that awakening to the truth can be brutal. But do know that you’re not alone. As the managing editor of The Invisible Scar, I receive tons of emails from people who have had this epiphany. And I tell them that, though this discovery is a hard one, you can get through this difficult time and move along the healing journey. 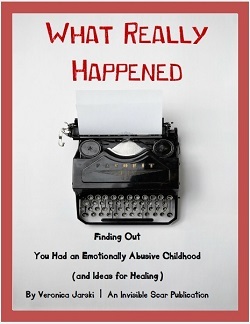 The 92-page e-book “What Really Happened: Finding Out You Had an Emotionally Abuse Childhood (and Ideas for Healing)” features 11 articles covering that first part of the healing journey. The already-published articles have been updated and expanded for a longer read. Download the PDF “What Really Happened: Finding Out You Had an Emotionally Abusive Childhood (and Ideas for Healing)” for just $7.99.